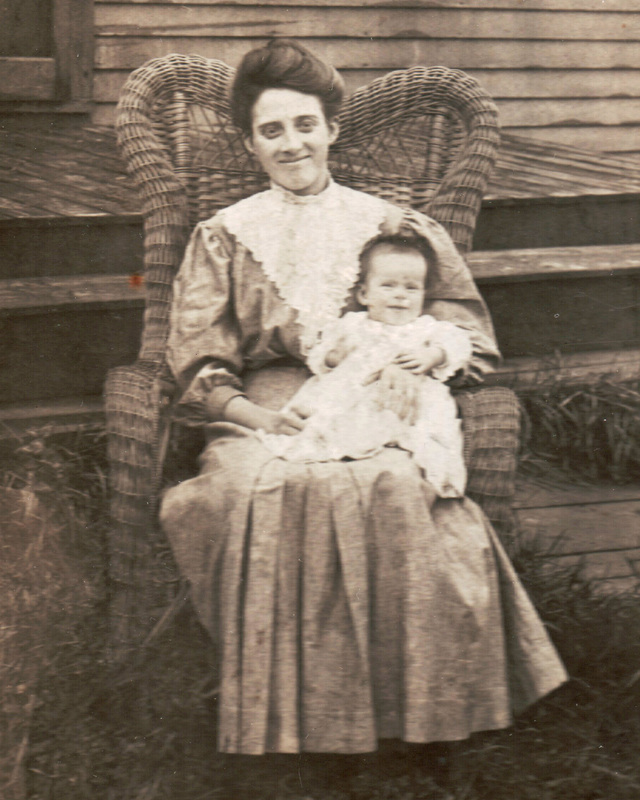 My great grandmother, Susan (Stanwood) Clark is shown above, holding my grandmother’s sister, Beatrice. My grandmother, Goldie (Simpson) Edwards, and Auntie Bea were the only surviving children born to Grandma Susie, who was herself one of eight children, seven of which lived to adulthood. Her father, Albert Stanwood, however, was one of only four children. Albert’s father, David, was from a family of six, born to Benjamin and Betsy (Wasgatt) Stanwood. Surprisingly, I’ve stumbled on a fair number of 19th century families in my genealogy (primarily in the Wasgatt lines) where only one or two children were born to the couple, while they were married many years. While not uncommon during current times, it certainly was not the norm in days past. It made me stop and ponder the reasons for these smaller family sizes. Infertility? Possibly. Choice? Maybe. But how? The Comstock law of 1873 declared birth control both obscene as well as illegal. So, what methods of birth control did our ancestors have available to them? While many religions frowned upon family planning (birth control viewed as something that immoral women or prostitutes would use, not those who were married), husbands and wives continued to look for ways to decrease the sizes of their families. A good example is extended and complete breastfeeding, which has been used around the world to increase the time between the birth of children. While many found this to be very effective, it was not popular among the wealthy, who often utilized wet nurses. Abstinence was another method of birth control, which was promoted in the 1870s for married women attempting to limit family sizes. Planned Parenthood attributes a rise in sexually transmitted diseases to this movement, as men began to turn to prostitutes instead of their wives. Barrier methods were also used. Surprising to many, the condom is one of the oldest forms of contraception dating back to Egypt about 1,000 BC. Originally created from animal gut in an effort to protect from syphylis, it wasn’t until the 1700s that the contraceptive properties of the condom were recognized. By the 1840s, rubber condoms were available, and in the 1930s latex condoms became popular. While birth control methods have certainly evolved through the years, and the 21st century woman has many options available to her today, it saddens me to think how many years it took for birth control to be accepted. While watching ABC World News last night, I was immediately reminded how much we take for granted. The segment included a Middle Eastern women with her newborn infant, who had the opportunity to talk via Skype to an American mom. She asked, “Are you also afraid of dying in child birth?” If such fears continue to plague the 21st century Middle East mothers-to-be, imagine the anxiety experienced by our American ancestors. According to the CDC, in 1800 in the average mother bore seven children. By 1900, the family size had decreased to 3.5 children, and six to nine of every 1000 women died in childbirth. Some statistics report that the 19th century death rate was as high as 10% for those giving birth. I am incredibly grateful for modern medicine and birth control, and even more in awe of my many female ancestors who married and had families without the advantages available to 21st century women today. This entry was posted on Saturday, December 17th, 2011 at 11:01 AM	and posted in Medical, Stanwood, Wasgatt. You can follow any responses to this entry through the RSS 2.0 feed. Thank you for sharing this thoughtful post. We should all remember what our foremothers went through (two children was enough for me, thank you), and I’m sure all of us have a female in our family tree who died soon after giving birth. Thanks, Elizabeth. Glad you liked the post. Just visited your blog and enjoyed your Hunter pictures!